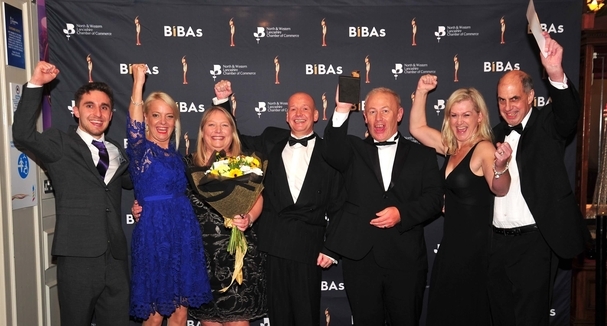 Pakawaste Group was nominated for three awards at this year’s 2018 BIBAs awards – Service Business of the Year, Manufacturer of the Year and Engineering Business of the Year. The whole Pakawaste team were delighted to have come away with the Engineering Company of the Year award, marking the first win at a BIBAs awards for the company. The BIBAs (Be Inspired Business Awards), Lancashire largest and longest running business awards programme, is an annual event that recognises and rewards great businesses and people. As with previous years, the 2018 awards ceremony took place at the Blackpool Tower Ballroom and, as always, acknowledged Lancashire’s growing businesses and celebrated the awards with a memorable evening of entertainment. The BIBAs judging process is very in-depth, and is made up of interviews at the North Western Lancashire Chamber of Commerce in Blackpool with key members of the business, including our CEO, David Hamer, Sales Office Manager, Chantal Calderbank and our Operations Manager, Dan Parkinson, allowing for our key members to demonstrate what sets Pakawaste apart from the competition. The ‘On Tour’ stage follows, where the judges are sent to the offices of the finalists to speak with various departments within the business, from the production department to the sales department to the service department. This also allows for the judges to see the day-to-day running of the company, including the manufacturing of machines, office processes and after-sales support. Pakawaste was awarded the Engineering Business of the Year award for its excellence in manufacturing reliable equipment at our Preston-based factory by our team of welders, fabricators and electricians. Pakawaste has proven its ability to create, nurture and develop products that have improved commercial and financial performance and operational effectiveness. Pakawaste is very proud of the award, although this does not mean we will now sit still. We look to continue to move forward and improve every day and to provide the very best quality equipment to ensure effective waste management solutions for all of our customers. Should you wish to arrange a FREE, no obligation site survey, please visit our website www.pakawaste.co.uk or call us on 01772 766688 and select option 2 for our sales department.